From afar, Dubai has always struck me as disgusting (indeed the Gulf States as a whole raise my hackles). It is a society where the super-rich who can purchase the good graces of the Sultan (or whatever rinky-dink title their life autocrat styles for himself) can literally do anything to anybody without any consequences. It is a slave state built on the suffering of others–mostly Indian and Pakistani workers who are bamboozled to come over and then worked to death in the oppressive heat or robbed by goons working for the aristocracy. It is a petro-state in which the oceans of wealth come from one and only one industry (a dangerous and supremely problematic industry at that). The flagrant & ostentatious Muslim extremism which is such a feature of life in the Middle East is much on display, but naturally the opprobrious strictures of the faith do not apply to the wealthy, and Mohammed’s lessons of compassion, self-discipline, and striving seem to be lost on his most outspoken followers in the middle and lower tiers of society (who read the divine poetry of the Koran and find only reasons that they are better than everybody else and excuses to abuse outsiders at their will). Also, the whole place is in a sweltering desert. It is what the United States aspires to be in the era of Donald Trump: a fundamentalist kleptocracy with lots of ugly towers where the sordid pleasures of the few eclipse the suffering of the many. But what pleasures they are! Today’s essay is a work of bemused praise for Dubai (sorry if that purpose got a bit, um, muddled in the first paragraph up there). The crazed rulers of the place have built one of the world’s most lavish pleasure gardens: the Dubai Miracle Garden. The garden is indeed a miracle, since it is built on a reclaimed desert. It is also a miracle of gardening artifice so formal, disciplined, and rigid, that it almost looks synthetic. Indeed it looks very synthetic: as though Mickey Mouse ate a lot of cheap candy and barfed on the set of Blade Runner. Opened on Valentine’s Day in 2013 the Dubai Miracle Garden is allegedly the world’s largest flower garden (as opposed to larger less densely planted parks, or the flower fields of Holland or Africa). With over 109 million blooming plants covering 72,000 square meters (about 18 acres), it certainly sounds like the most densely planted garden. The flowers are built into pavilions, buildings, and colossal sculptures like some nightmare from Jeff Koontz. To my eye, the plants of the Dubai pleasure garden mostly look like flashy annuals. That would be highly appropriate since it is a disposable venue. Every year the gardeners tear everything out and build a whole new world out of flowers. The greatest highlight seems to have been the flower version of the Emirates Airbus A380 (pictures of which are heavily featured in this post). However certain features, like the flower clock and the 850,000 sq ft multistory garage seem to be perennial (I could not tell if the garage was made of flowers too, or of some more prosaic material). Although I have poked fun at it, I really would like to see the Dubai Pleasure Garden. It is an astonishing accomplishment and the sheer excess gives it a Baroque beauty. Indeed my appetite for extremes makes me want to see all of Dubai (which exemplifies the same excessive style), but I feel like I might have burned some bridges in that respect with this selfsame blog post. Fortunately, if I wait around, Brooklyn will probably look the same in 20 years. Since I doubt I am going to become an oligarch, I might even get the opportunity to build the Brooklyn Miracle Garden with my own two hands as Jared Kushner or some such cruel overseer master gardener directs with the whip long flower pointer. Here are 2 troubling stories from opposite corners of the internet…and they are related in a way which is worth addressing. The first concerns the new addition to the Federal Reserve Board, Marvin Goodfriend. Goodfriend is a famous hyperinflation phobic. He believes that quantitative easing (or any sort of monetary stimulus) in the American economy will cause the worth of money to deteriorate in one of those nightmarish economic breakdowns familiar to residents of Zimbabwe or the Weimar Republic. This concept has been substantially debunked both by economic theorists with slide-rulers and by the real-world example of Japan which stagnated for decades thanks to thinkers like Dr. Goodfriend. Yet Goodfriend obdurately refuses to admit any error in his models. Of course, it is possible that Goodfriend is a bad person who wishes for society to fail (his surname is suspiciously similar to what some shapeshifting demon might choose to best beguile foolish mortals), but the point of this post is not to castigate this one reactionary central banker. We are using him as an example of a bigger problem which humans have. The second story involves the horrifying story of the crazy Turpin parents who had 13 children whom they shackled, abused, and tortured for decades in private. The younger cohort of these pitiable children were “home schooled”, but the eldest child did attend public school where her classmates recall her as a sad awkward child who smelled funny, was smaller than everyone, and always wore the same threadbare purple outfit. As you might imagine, if you ever were a child, these haunting peculiarities did not cause her classmates to ask what was wrong (indeed all of society failed to ask that germane question for 20 years), instead she was mercilessly picked on, taunted, and abused. Although the run-of-the-mill sadists of grade school probably didn’t register compared to the world class sadists who were her birth parents. We know this about the little girl’s childhood because one of her classmates remembered her–and remembered picking on her and taunting her and wrote a heartfelt essay about it. The internet has mercilessly jumped on this guy with wild abandon. He has made himself a target of all sorts of anger and attacks. It seems unlikely that a third-grader could have changed much: his admissions were brave and have aided the public discourse about what is clearly a deeper problem. Yet in zeal to express their righteous anger over a social failing people have piled onto him. Primates have a weakness. If any individual backs down they lose their status. In the human world this means that those who admit failure or wrongdoing, are shunned and detested. This would seem to have a certain cruel logic, and yet the world is bewilderingly complex. As one tries to impress one’s fellow primates, it is easy to make mistakes (like picking on a classmate or choosing an economic model which inflicts maximum damage to workers). If a person admits they are wrong, they give up much of their social status–the real cheese at the heart of our rat’s maze society. But if we can’t admit to these mistakes and learn from them and change then all society worsens. I picked on Goodfriend because he is in the news and because he will undoubtedly deepen the next economic crisis, which could be right around the corner (and because picking on people is a cheap way to gain status) but I could have chosen unrepentant & willfully ignorant characters much closer to the top of society. A certain president, for example, has never admitted he was/is/will continue to be wrong. His ironclad refusal to ever admit mistakes in any realm seems to be one of the chief sources of his power–although punitive/ reactionary economic models and ruthlessly picking on the weak seem to help him too. There is a reason I chose these examples! But we don’t want to get off track. We want to compare the person who was heckled by the entire internet for thoughtfully admitting a mistake made as a child versus a retrogressive hack who has ascended to craft world monetary policy precisely because he never addressed well-known problems with his worldview. There is clearly every reason to never admit you are wrong! If we can’t figure out what is wrong, we can’t fix things without solving a baffling puzzle, and then facing off in the court of public opinion against all of the people who obdurately refuse to admit or even see the truth because it would diminish their cachet. That situation seems to in fact be where we all are. It is a paradox that those who never admit mistakes are given precedence over those who learn from their errors. It is a mistake we are all making and we need to rectify it. Except for me of course…I am a cunning essayist above such things. Did you all watch Moana? That movie was amazing! It may be my favorite Disney movie (and I am a big fan of hand-drawn animation instead of the computer rendered stuff, so that is really saying something). The eponymous hero is brave and truly heroic, yet her strength does not come from magic or violence (or a marriage proposal from some foppish prince), it comes from constant striving to go farther and understand things better. That is a rare thing in our entertainment world. Naturally, the talk about Moana has largely centered around two things: (1) whether it is secretly an allegory of American politics (I don’t think it is…exactly…but clearly there are uncomfortable parallels); and (2) whether it bowdlerizes Polynesian culture (it does, but, come on! kids’ cartoons flatten and distort every story and the movie presents Polynesian culture with respect and wonder). “Hercules” and “The Hunchback of Notre Dame” destroyed those stories: in Disney’s hands they literally ended up with opposite meanings (and endings) than in the original versions, but you don’t hear French people and ancient Greeks complaining. Lately, in our world, everyone seems to be becoming ever more tribal. We are swift to find (or imagine) insult about anything concerning our group or worldview, and strangely unable to perceive the wonder and possibilities of the bigger picture. I have been writing about princesses because I want people to stop being so stupid and tribal. We need to re-examine the leadership archetypes we grew up with so that we can make some better choices. There are two antithetical reasons we sell the concept of princesshood to little girls. The first reason is about making children behave. If you master rules and norms, people will like you and you will succeed. The other is about true leadership, not by coercive means like threats, lawsuits, or bossing people around, but by generosity, and imagination, and beautiful example. If you making your life into something remarkable and amazing, other people are drawn towards you and want to follow you. Everyone has to tread the line between these two poles– whether you have to submit to the whims of the great masters and the weight of society–or whether you can build a life of beauty, meaning and worth on your own terms. Moana masters both, and is able to lead her people beyond the reef back to their true heritage of exploration and discovery. People worldwide are growing dissatisfied with the self-satisfied conclusions of the post Cold War era of globalization and automation. They ask whether we should turn back the clock to make society more insular, static, tribal, and impoverished (yet more safe), or whether we should instead keep growing, learning, and discovering—even if it puts us at danger. It strikes me that there can only be one answer: the insular society of the 50s was not really all that safe. The only way is forward; there actually is no road back. We will keep exploring this idea, but in the meantime watch Moana, and tell me your opinions about princesses (or share some favorite childhood memories). We are starting from the beginning in rediscovering what is best about leadership and how to move on to a future which is worthwhile. Reexamining some cherished archetypes is a good place to start, but there is a lot we need to talk about concerning where we want to go and who we want to be. Today, as we continue through “princess week”, Ferrebeekeeper introduces a whole new feature: movie reviews! For our inaugural cinematic post, we are writing about a mediocre fairy-tale movie made thirteen years ago for little girls. “Ella Enchanted” stars Anne Hathaway, Cary Elwes (as the evil prince! ), Eric Idol, and a whole bunch of people I have never heard of. Featuring jarring joke anachronisms, weird pacing, strange scenery, and some pretty hammy acting, “Ella Enchanted” is not “Citizen Kane”. Yet the protagonist Ella is played by a young Anne Hathaway who brings her full emotive talents to the role and gives real poignancy to the nightmarish plight of central character. And, even though this a children’s movie, the central problem is horrifying. The movie’s magical fairy godmother is a mercurial entity who uses her magic capriciously. When presented with infant Ella, this fay sorceress is revolted by the chaotic nature of babies. She uses her power to endow Ella with a terrible gift: absolute obedience. Ella must promptly do whatever she is told by anyone. Ella’s loving family shields her throughout childhood by home-schooling her, keeping her away from outsiders, and avoiding idioms & imperatives as much as possible, yet adulthood and the world inevitably intervene. In the wider world, obedience is a terrible curse. Malicious and malevolent forces abuse Ella and make her into a pawn. Any stranger can kill her with a careless word or cause her to do the most terrible things imaginable. At one point, she gets in a cooking pot while ogres light the fire. Ella falls in love with the handsome prince (who seems quite taken with her beauty, wit, and seemingly impulsive character, however the realm’s other political players swiftly recognize and exploit her curse. Acting under the direction of the wicked regent, she must kill the handsome prince at midnight… Does she murder her true love, or can she find a way to break the compulsion of obedience laid upon her in her infancy? Now I don’t want to ruin Ella Enchanted for you…so I won’t. You can go watch this thing if you want to find out the ending (if you can’t already guess how it turns out). I am writing about it because I can’t stop thinking about it. The malevolent fascination of ineluctable obedience gives the movie far deeper resonance than it perhaps merits. Watching someone trapped under a terrible compulsion do what others desire is enthralling. There is fear and horror shining in Ella’s eyes as she goes around hurting people and destroying herself at the whim of others. And yet, dare I say it, it all seems…familiar. Society is built like “Ella Enchanted” and most people are acting under compulsion to do things they don’t care to do. A great many of these things are self-evidently stupid and pernicious. We live in a world where you have to drive or else be run over. If you answer your mail wrong you could go to jail. Social compulsion makes even the most powerful people into puppets. And if you balk very much at all, you go out on the street to freeze and starve. And there is an even darker other half to “Ella Enchanted’ which we could think of as ‘Everyone Else, Entitled.” In the movie, most people are perfectly happy to take advantage of Ella (just as most of us don’t care how we get out iphones and chicken dinners). People very quickly come to think “Now you work for me. I own you and control you and tell you how you must feel and must act.” Such ideas apparently just come naturally. Exploitation seems to be a built-in price for society—fore REAL society, not just this stupid movie. Yet, to leave the real world and return to Ella and princesses. The entities who control Ella never control how she feels about things. A princess has autonomy even if, sometimes under duress, she can only use it in the smallest ways. Ella figures out the secret to breaking her enchantment and winds up a princess (oops, did I spoil the movie?). In fact, she was always the hero (that handsome prince was a bit of a stuffed-shirt, if you ask me). The real question is whether we can learn this lesson? Can we find the right touch to make use of use little moments and fleeing opportunities in a life filled with compulsion? Is there a way to escape, or at least partially master society’s oppressive burden of obedience? Can we ever really be autonomous and star for a moment as the hero in our own life? It is a big question, and the answers are not as certain as a princess’ storybook ending. An artist’s rendition of a solar sail spacecraft! The Planetary Society is a club which believes we should spend more resources exploring space. I used to be a member back in the halcyon days when I could afford their annual dues, but alas, I have merely been following their exploits lately. Mostly they are a political action committee: they use their money to hire lobbyists to remind recalcitrant leaders of the many, many benefits of space exploration. Also they showcase celebrity explorers, scientists, and astronomers (or other famous folk) in order to popularize space research to the fickle and forgetful public. Well, that’s what they do most of the time…Sometimes they spearhead astonishing James Bond schemes of their own. The most recent of these grand plans involved buying a converted Soviet ICBM and using it to launch a solar sail into outer space! 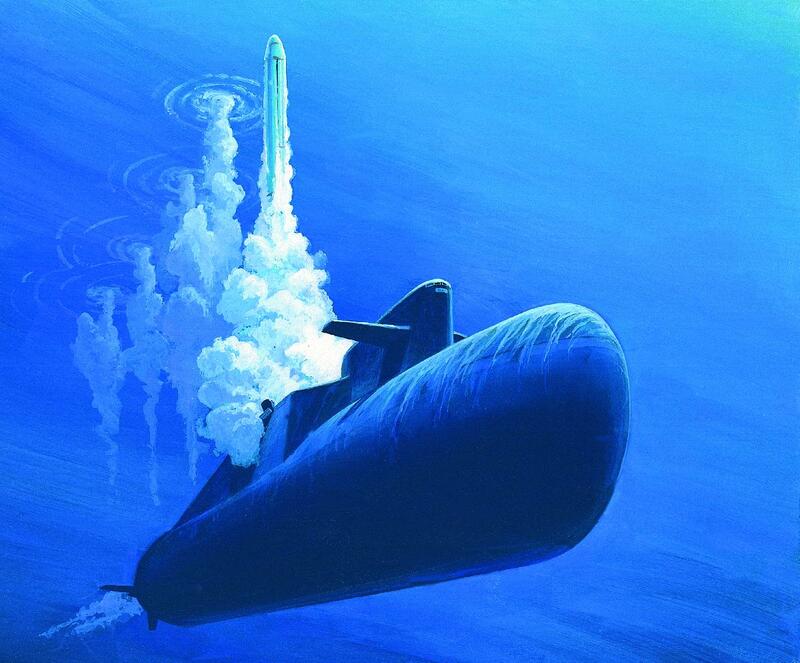 Sadly (yet somehow predictably) the Russians sold the Society a dodgy bum missile which failed after a minute and a half of flight and exploded over the Arctic Ocean. This happened ten years ago, and despite the abysmal failure, I felt honored to be part of it! When did you last cooperate on a project which would make Blowfeld jealous? (I exempt mention of my tax dollars which go to NASA—you federal scientists are awesome and I want you to keep it up, but I am talking about a private club right now). Anyway I bring all of this up, because the Society has scraped together enough pocket change to try again (even without my annual $37.00 membership fee). In five days they are launching a test flight which will pave the way for a full-fledged solar sail launch in 2016! The Society learned certain things from the failure a decade ago, most notably “do not trust the Russians” (a lesson which is written upon the very landscapes of Eastern Europe and Central Asia to the extent that it is visible from space, but which was still somehow lost on the Planetary Society until they actually purchased an ICBM). 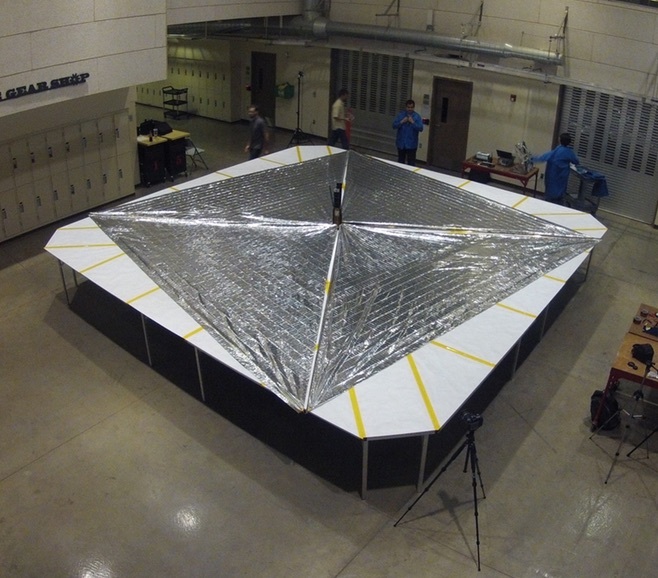 The Planetary Society’s LightSail spacecraft, with its four sails deployed, undergoing tests in Sept. 2014. Credit: Justin Foley/The Planetary Society. This time they are buying aerospace capacity from more reputable sources—the US Air Force (for the upcoming test flight) and SpaceX for the full mission. I mention all of this in order to direct your attention to the test flight on May 20th (EDT) which Ferrebeekeeper will definitely revisit and to also point you toward the Kickstarter funding project for next year’s full fledge flight! 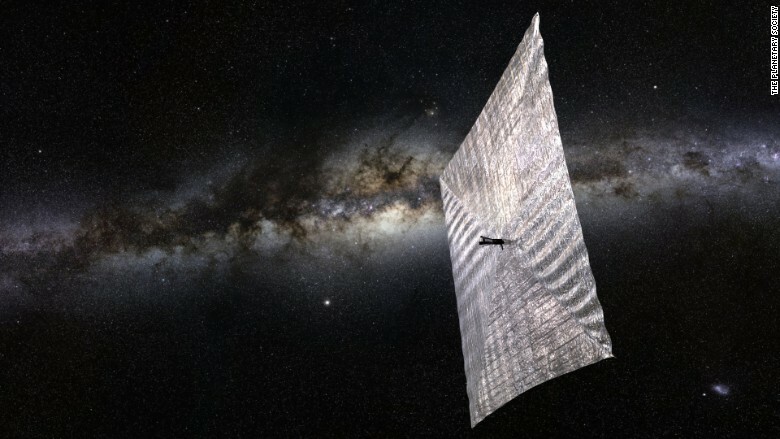 If you have some money burning a hole in your pocket, you could always spend it launching a high tech sail the size of a New York apartment into space (well, maybe the actual spacecraft will be larger than that once it unfurls from its breadbox size cubesat). Aside from buying stunning original artwork, what could be a better use of your petty cash? 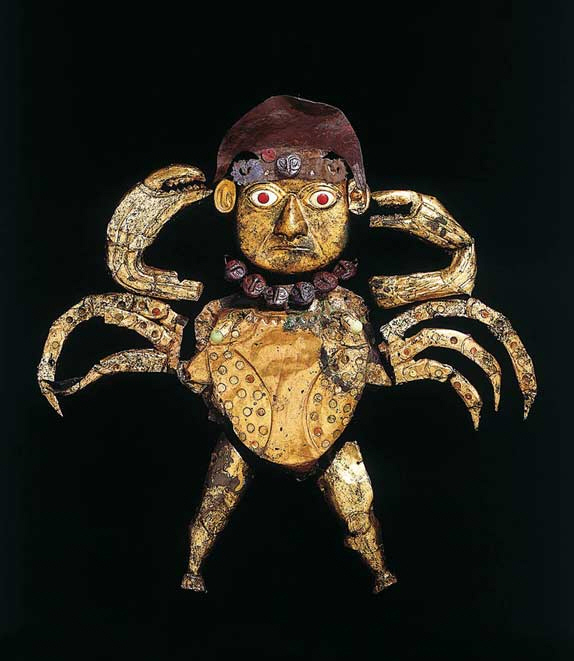 The Moche civilization was a culture which flourished between 100 and 800 AD in northern Peru. Although the Moche had sophisticated agricultural know-how and created elaborate irrigation canals to water their crops, their religious iconographs shows that their hearts belonged to the ocean. This seems to be literally true, their greatest god, Ai Apaec (AKA “the decapitator”) was a horrifying aquatic deity with the arms of a crab or an octopus [I desperately wanted to feature this deity in my Gods of the Underworld Category, but there is not much hard information about him. I’m still tagging this post to that category because…well, just look at him]. Ai Apaec thirsted for human blood and Moche religious ceremonies seem to have been based around human sacrifice. There is substantial archaeological evidence available about the Moche people and their civilization. Several large structures remain extant in the dry climate of Northern Peru. From these temples and graves, we can get a sense of Moche society. Bourget and his team uncovered a sacrificial plaza with the remains of at least 70 individuals–representing several sacrifice events–embedded in the mud of the plaza, accompanied by almost as many ceramic statuettes of captives. It is the first archaeological evidence of large-scale sacrifice found at a Moche site and just one of many discoveries made in the last decade at the site. In 1999, Verano began his own excavations of a plaza near that investigated by Bourget. He found two layers of human remains, one dating to A.D. 150 to 250 and the other to A.D. 500. In both deposits, as with Bourget’s, the individuals were young men at the time of death. They had multiple healed fractures to their ribs, shoulder blades, and arms suggesting regular participation in combat. They also had cut marks on their neck vertebrae indicating their throats had been slit. The remains Verano found differed from those in the sacrificial plaza found by Bourget in one important aspect: they appeared to have been deliberately defleshed, a ritual act possibly conducted so the cleaned bones could be hung from the pyramid as trophies–a familiar theme depicted in Moche art. 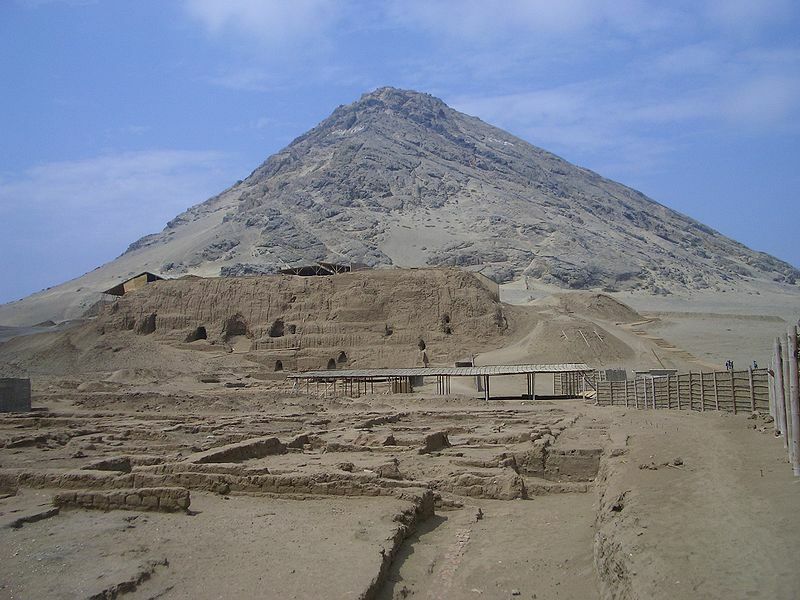 A view of the Huaca de la Luna, with Cerro Blanco in the background. 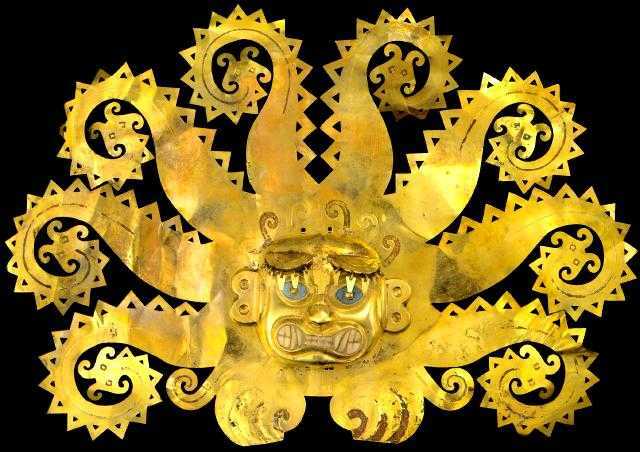 We know a great deal about Moche culture not merely from such rich archaeological finds but also from the vivid artistic skills of the Moche themselves. Not only were they accomplished painters, the Moche were among the world’s great ceramics makers. They crafted vessels which beautifully portrayed deer, birds, mollusks (like the spiny oyster), and other sea creatures. They also made many ceramic art objects portraying war, agriculture, economic activities, and copulation. Many of these Moche ceramics grace the world’s great museums: the expressive grace of the crafting speaks to a society which understood and revered beauty. 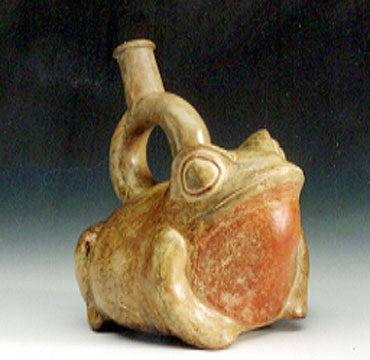 The decline and failure of Moche civilization is something of a mystery. The civilization reached an apogee early in the 6th century. Then the great communities of that era appear to have been wiped out by the climate change which affected civilizations worldwide. It seems like the horrible weather events of 535–536 played particular havoc with Moche society. However the Moche survived these upheavels and settlements have been discovered from the middle of the seventh century onward to 800 AD. The character of these latter communities is different from that of the golden age Moche civilizations. Fortifications were much in evidence and the trade and agricultural underpinnings of civilization seem to have been much reduced. Perhaps the Moche were involved in a series of internal battles among varying factions and elites.